Prior to Copley terminating the synidcation of his column Bandow's column was carried by numerous major newspapers. He has also written for magazines such as Fortune. Bandow also speaks regularly in front of students and business groups and frequently appeared as a radio and television commentator. A former visiting fellow at the Heritage Foundation, he served as a special assistant to President Ronald Reagan. However, he has become a vocal critic of President George W. Bush, calling on him to "apologize to Americans" for his policies in Iraq. Bandow is a member of the Coalition for a Realistic Foreign Policy. Bandow is also a member of the Board of Scholars of the Virginia Institute for Public Policy. Doug Bandow (coeditor), Perpetuating Poverty: The World Bank, the IMF, and the Developing World, 1993. Doug Bandow, Tripwire: Korea and U.S. Foreign Policy in a Changed World, 1996. 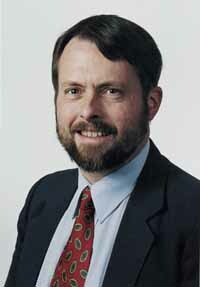 "Doug Bandow", Cato Institute, accessed December 2005. "Archives: Doug Bandow", Townhall.com, accessed December 2005. "Doug Bandow", Future of Freedom Foundation, accessed December 2005. (This page includes an archive of his FFF articles). "Foundation for Economic Freedom", Foundation for Economic Freedom, accessed December 2005. (This page includes an archive of his FEF articles). Doug Bandow, "Why Conservatives Must Not Vote for Bush," Salon.com, September 10, 2004. Doug Bandow, "Look in the Mirror, Mr. President," Salon.com, August 1, 2004. Doug Bandow, "The lesson Jack Abramoff taught me", Los Angeles Times, January 4, 2006. Eamon Javers, "Op-Eds for Sale," Business Week, December 16, 2005: "A columnist from a libertarian think tank admits accepting payments to promote an indicted lobbyist's clients. Will more examples follow?" "Author Doug Bandow Admits Taking Money from Abramoff", Editor & Publisher, December 16, 2005. Dave Astor, "Cal Thomas and Connie Schultz Weigh in on Bandow Payola Scandal", Editor & Publisher, December 16, 2005. Finlay Lewis, "CNS columnist is suspended", San Diego Union Tribune, December 17, 2005. (CNS is the acronym for the Copley News Service). Anne E. Kornblut and Philip Shenon, "Columnist Resigns His Post, Admitting Lobbyist Paid Him", New York Times, December 17, 2005. "Excerpt From a Column Favorable to a Client", New York Times, December 17, 2005. Citizen Outreach, "Doug Bandow Joins Citizen Outreach as New Vice President of Policy", Media Release, December 28, 2005. "Ex-Columnist Bandow Quickly Gets New Job Despite Payola Controversy", Editor & Publisher, December 30, 2005. ↑ Who's Involved, Save Iraqi Christians, accessed August 10, 2008. ↑ Experts, Campaign for New American Policy on Iran, accessed September 16, 2008. This page was last edited on 16 September 2008, at 03:20.